Will Hutchins remembers his visit to NEBRASKAland Days. I take back all the nasty things I said about Nebraska over the years. The dad-blamed corn huskers have administered woeful whuppins to my beloved west coast teams on football fields of battle. Well, if you can’t beat ‘em, join ‘em. 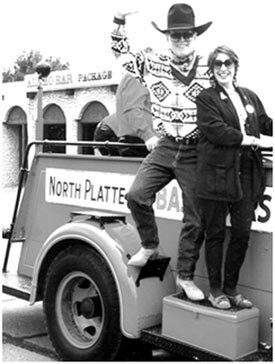 Babs and I did just that one year, when we received a royal invite to come on down for all the fun at the 35th annual NEBRASKAland DAYS in North Platte. I felt like a fraud prince. Figured they had me mixed up with Clint Eastwood or something. I don’t exactly wear shades because of limelight glare. (Actually, I don’t need glasses—just a question of seeing.) We accepted pronto before they could change their minds, boarded the great silver bird and flew to the surrealistic Denver airport. Ever been there? Looks not unlike a scene from the Arabian Nights. A strrretch limo pulled up. I reckoned a local college’s pole vaulting team would debark. Instead, we were greeted by two dudes in wide-brimmed hats and wider smiles. “Hop aboard, pards,” said they, and across the rolling plains we rode. We saw a few clouds, deer and antelope playin’, buffalo roamin’ and we heard nary a discouragin’ word—not a car horn—Nebraska provides shelter for an endangered species: the considerate driver. I thought they were extinct. Buffalo Bill’s statuette reminds me of a George Montgomery sculpture. Ol’ Bill’s taller, heavier, and rarer than Oscar. He’s a man of bronze—Oscar’s gold-plated tinsel. (Beulah, peel a sour grape). Our wonderful hosts put us up in a snazzy suite with separate but equal bathrooms. The hotel reminded me of Tara in “Gone with the Wind”. A red-carpeted winding stairway led to our digs on the second floor. One night Babs and I recreated Scarlett and Rhett’s big scene. We drew gasps from the throng below when Babs tripped and almost dropped me. Some more of the highlights of this sensational shebang: Flapjack and pork chop feeds—a silly radio interview in which I pantomimed bronc ridin’ and steer rasslin’—an antique car parade, Babs and I rode on the side of an old red fire truck, tossing candy to children of all ages. I shouted, “I wish these were diamonds!’ The kids were happy with the candy. Warm hearted mayor Jim Whitaker presented me a plaque officially designating me an admiral in the Nebraska Navy. In response, I sang a slightly bawdy rendition of “She Was Just a Sailor’s Sweetheart”. We met some real sailors assigned to the nuclear sub Nebraska. They stay submerged to make the world safe for democracy and only surface when it’s time to re-enlist. Then the big parade! We sat in a percheron-driven buggy, Governor Mike and Mrs. Stephanie Johanss gingerly walked behind us—At parade’s end, Babs asked our driver to hitch up in front of a garage sale. Babs is a cowgal second, a woman first! In town, at the majestic old Fox movie theatre, we were thrilled by the super-talented Georgeann Sheets and Red Steagall and their cowboy music and poetry. A trip to the breath-taking sand hills of the 34,000 acre 77 Ranch—A tour of the Buffalo Bill Ranch, Scout’s Rest. Lillie Langtry’s lovely portrait graces a bedroom wall.